The main female protagonist. 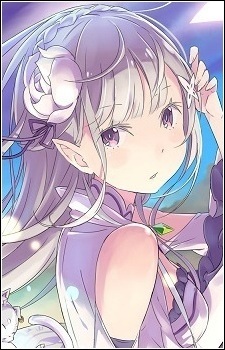 She is a silver-haired half-elf girl who is one of the candidates to become the next ruler in the royal election. Subaru first meets her when her insignia is stolen by Felt as she needs to possess it to be eligible to participate in the election. She introduces herself as Satella when she and Subaru met during the first timeline before introducing herself by her real name when she got her insignia back. Emilia is good natured and likes to take care of others, though she herself refuses to admit it, instead thinking of it as her own selfishness. She is indifferent to her own appearance, leaving Puck to take care of her clothes and hair. Because her appearance is similar to the Witch of Envy, she has received unfair discrimination from others. She sometimes acts like a child and is unacquainted with the world as she used to live in the woods with other Elves, though despite this she still works hard to become a ruler.